Today I’m partaking of a great British tradition – High Tea. What a lovely way to spend an afternoon. Sipping on bottomless Prosecco and trying out a range of aromatic teas while nibbling on delicate sandwiches, pastries and cakes. All in the wonderfully stylish surroundings of Lanes of London. The restaurant’s large, light-filled room looks out towards Hyde Park – get a table by the window if you can. There’s not a lot of decision making today as the food menu is set. You will have to choose your teas but don’t worry it’s all clearly explained by the charming waiter. Our first selections were Flowering Osmanthus and Blackcurrant & Hibiscus. 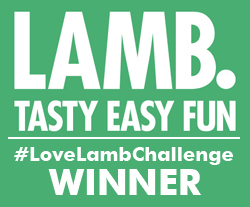 And after our feast of tea-time delights we finished off with the wonderfully refreshing Whole Peppermint Leaf – the perfect digestive. Once you’re settled and sipping, the prettiest platter of sandwiches arrives. Four masterpieces – love what you can do with a sandwich. The mini poppy seed-covered bun was lightly toasted with ham and deliciously cheesy melted cheddar, cucumber sandwiches came with two layers of cucumber, there were soft little squares of egg mayo delight and thinly sliced smoked salmon on beetroot-coloured bread. These are no ordinary sandwiches. I could eat plates of them! 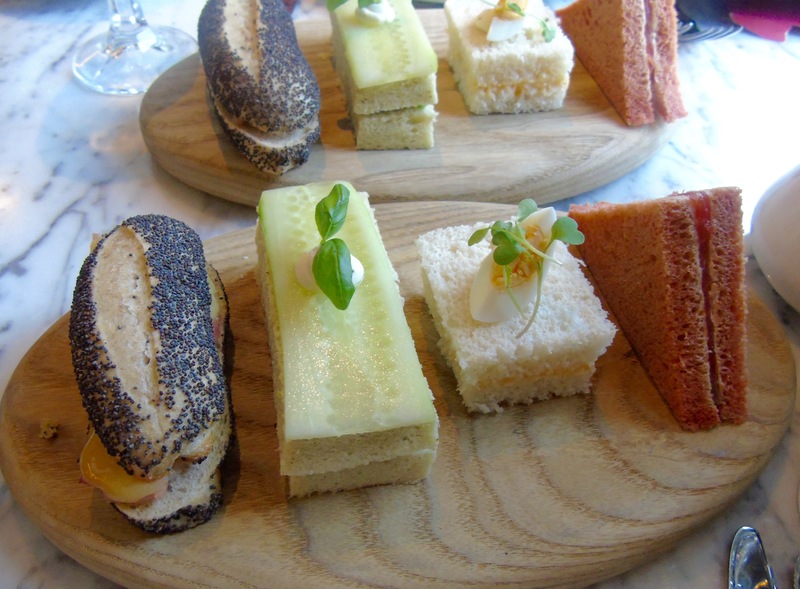 Loved that the cucumber sandwich was topped and filled with cucumber, sliced perfectly to the size of the bread and that the egg mayo was topped with a slice of quail’s egg. Then it’s time for the Cake Stand. 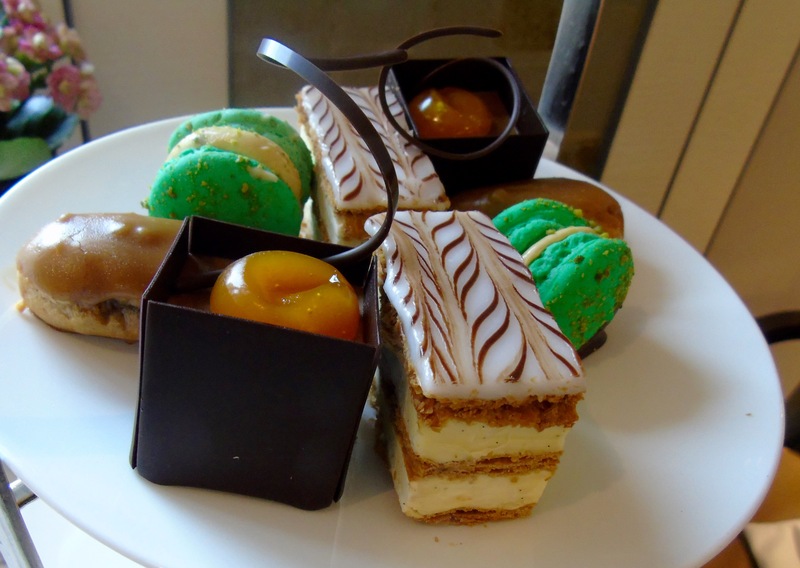 There’s definitely something about this tier of sweet treats that gets the heart beating faster. It’s a beautiful thing. Starting from the top a collection of millefeuille, macaroons, chocolate mousses enclosed in slices of dark chocolate and melt-in-the-mouth mini choux pastries with coffee icing. 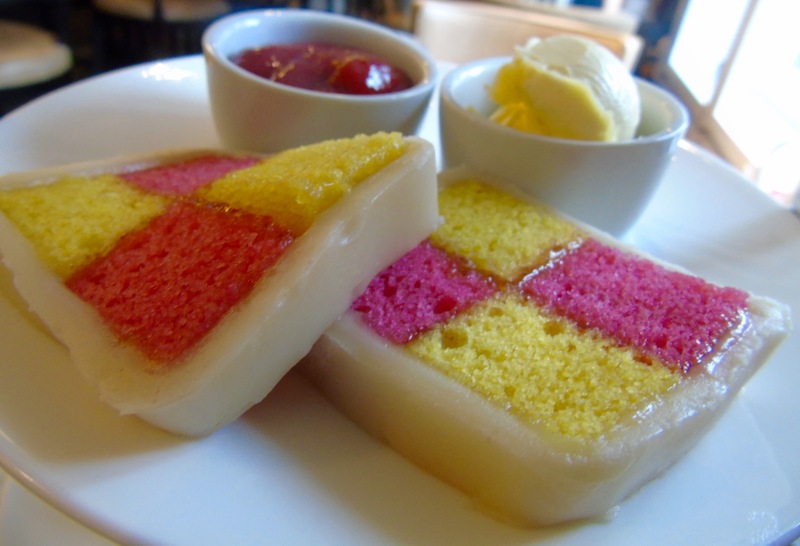 It’s made by baking a yellow and a pink sponge separately, then cutting and combining the pieces in a chequered pattern – holding them together with jam and then covered with marzipan. Sounds like a huge effort to me, but I suppose it’s worth it when the end result’s such a thing of beauty. The strawberry jam and clotted cream for the scones are in the background – because scones are coming next! 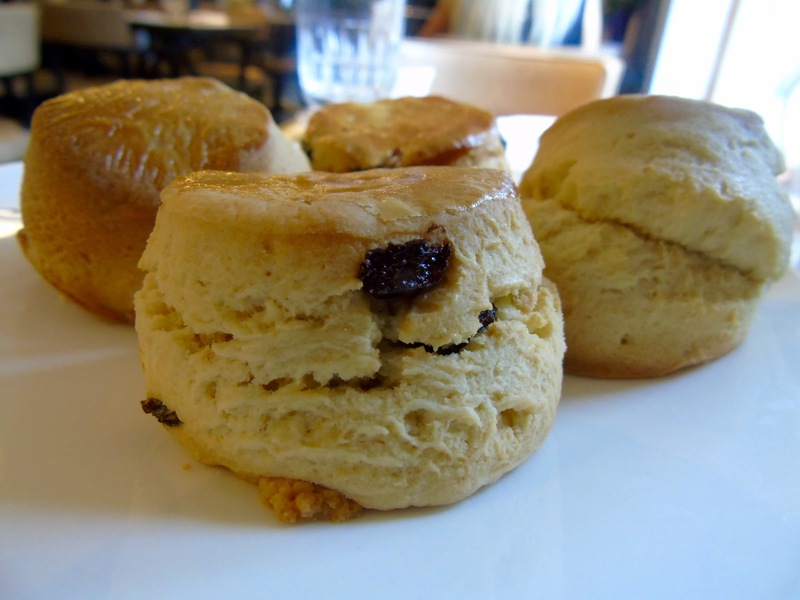 It would be wrong to have tea in England without having scones. Today there were two types – plain and raisin, light and crumbly and served with the classic jam and cream topping – possibly one of the most perfect food combos ever conceived of. 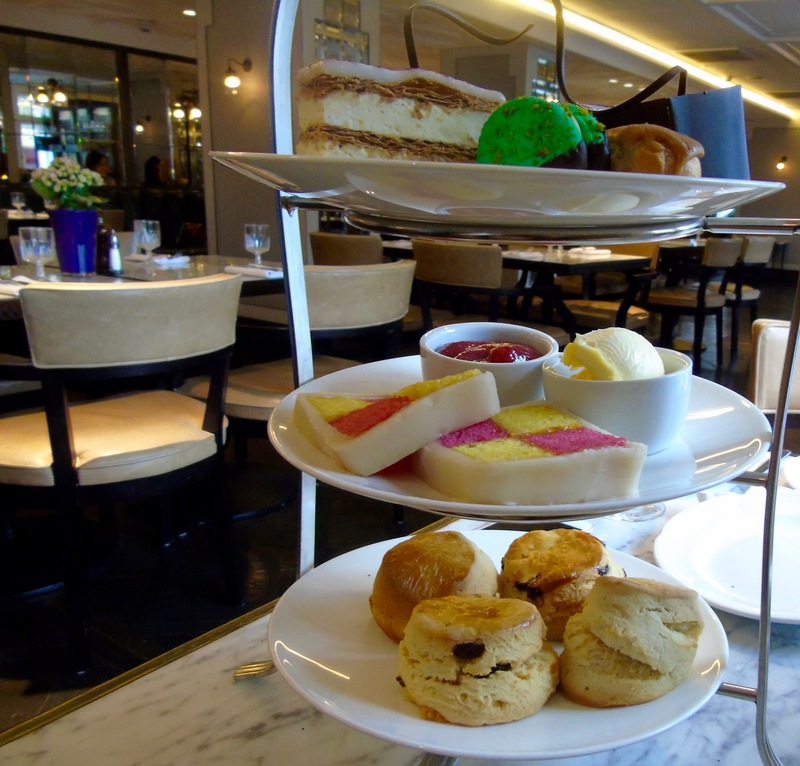 High Tea – which includes all the food above and your choice of tea is £39. For £49 you can also include free-flowing Prosecco. Menus change through the year. Currently you’ll find your tea will have a distinctly seasonal feel. Lanes of London is at 160 Park Lane, W1 a minute’s walk from Marble Arch tube station. 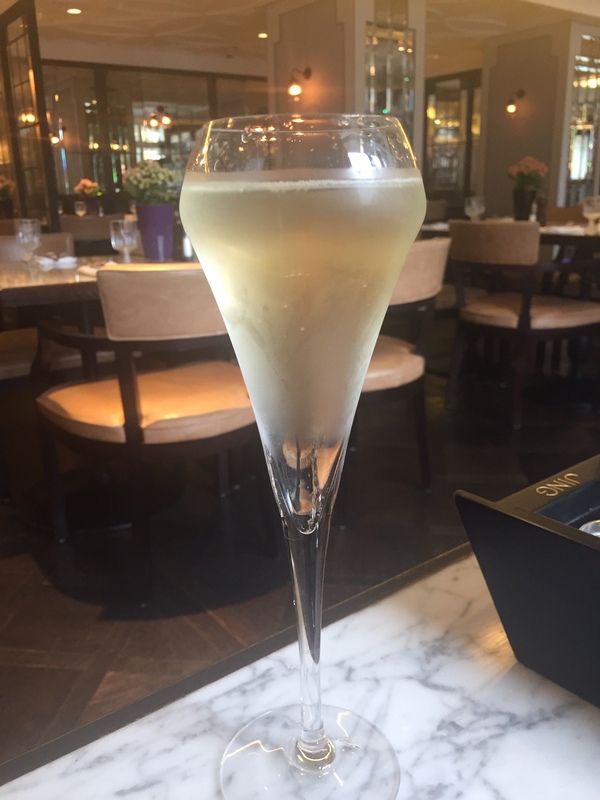 this looks absolutely fabulous – would love to join you there next time we are in London! Oh yum…a proper English tea! Did you wear a frock ?gloves and pearls? It was lovely Angie definitely must do it when you are here. Haha Esme. Should do next time.